Click the button below to add the Clevamama - Toddler Pillow (Free Infant Travel Pillow) to your wish list. 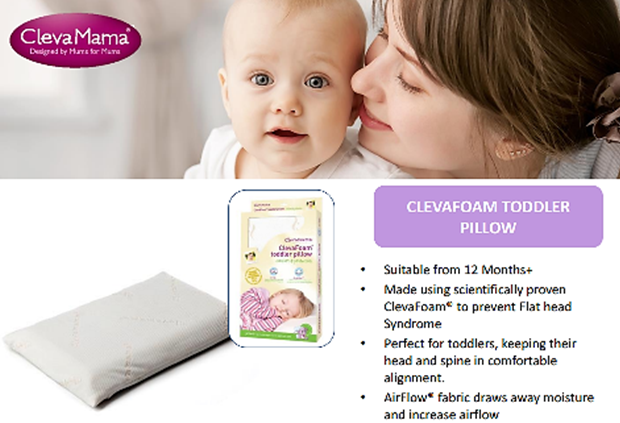 The ClevaFoam™ Toddler Pillow offers the optimum is comfort and support for your toddler. Perfect in size and design this pillow helps ensures as peaceful and restful night’s sleep and is the just right for your toddler’s first pillow. to protect the round shape of your baby’s soft head and helps reduce the effects of Flat Head Syndrome (Plagiocephaly). This comfortable and luxurious pillow has the added benefit of Airflow™ which will draw away moisture and increase airflow for the ultimate “Snug-ability”. Specifically engineered, the study found that ClevaFoam™ reduced the pressure on baby's head by 50%, while providing 80% more support. When exposed to the heat and weight of a child’s head ClevaFoam™ reacts by softening and moulding itself to the exact contours of your child’s head. Unlike ordinary pillows ClevaFoam™ doesn’t bounce back and create pressure points that can lead to Flat Head Syndrome. The design of this pillow ensures that your child’s head and spine is in the correct position and alignment. It was worth every cent we spent on this item. Our baby feels so comfortable using this pillow. Reserved the toddler pillow for when she grows older. Pillow is soft and comfortable. Great value as it comes w a baby pillow!